"I'm about to go explosive on these motherf*!*rs!" 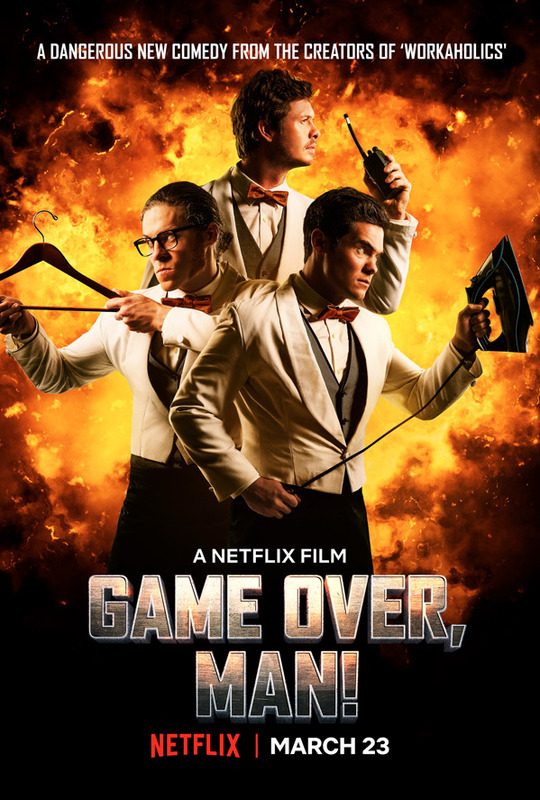 Netflix has debuted the full-length official trailer for the action comedy titled Game Over, Man!, the first feature film made by the "Workaholics" group. The film stars all three guys from "Workaholics" - Adam Devine, Anders Holm and Blake Anderson - and is directed by one of the creators of the show. These three actors have already landed other major roles in all kinds of movies, but this time they're finally coming together to tell a story of three stoner gamer friends about to sign a big financing deal when their main investor is kidnapped by terrorists. These three "zeroes" become heroes (sort of) when the hotel they work at is taken hostage. This seems like a big riff on Die Hard, but with the "Workaholics" guys going stoner crazy, and it looks like hilarious fun. I'm definitely in for this. You can see the first teaser trailer for Game Over, Man! from last year here, if you want to watch it again. In this action comedy, three friends are on the verge of getting their video game financed when their benefactor is taken hostage by terrorists. Game Over, Man! is directed by American filmmaker Kyle Newacheck, one of the creators/directors of "Adam Devine's House Party" and "Workaholics", as well as many other TV shows and short films. The screenplay is written by Anders Holm, one of the other stars of "Workaholics". The film is produced by Evan Goldberg and Seth Rogen, as well as powerhouse producer Scott Rudin, and the rest of the "Workaholics" group. Netflix will release Newacheck's Game Over, Man! streaming exclusively starting March 23rd, 2018 in just a few months. What do you think? Who's down?